With Divine urgency humanity is being called on to remember: more than any other vibration coming to us from other diverse lesser sources, however tempting or alluring, it is the frequency of love and truth radiating out from the deep inner pulse of the Heart of God, that will bring to us the peace and love we seek and long for. It is this true eternal pulse that most naturally resonates within our hearts and minds for our souls sprang forth from this true eternal pulse. 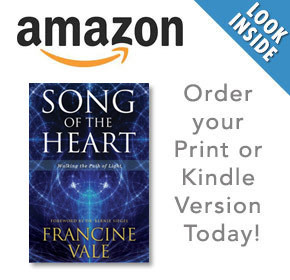 And yet, mankind behaves in opposition to the heartbeat and vibration of the Heart of God and chooses instead, the pain and sorrow that derives from association with destructive vibrations. Although humanity has passed through centuries of war and destructioin, and light and love in the form of peace on Earth has passed into ancient myth, Divine harmony embedded within each moment remains true and constant. Although generations have been taught that war and destruction are human destiny, and they pass through the moments of their lives distracted by chaos, thereby permitting chaos to expand and gain dominion over the moments of time, Divine love clothed in grace awaits the transformation of humankind. How shall we, as individual human beings taught to believe in the doctrine of individual powerlessness, respond to this directive?